1. Browse to the UI virtual appliance at http://[IP address]/admin. 2. Log in using the admin ID and password. 3. Select the Update tab and browse to the location of the VMware-vcops-viewadapter.pak file. Click I Accept the Terms of This Agreement and click OK (see Figure 30). Figure 30. Add the View adapter to vCOPs. You have now completed the integration of vCenter Operations Manager for View. To access the new dashboards, browse to your UI virtual appliance at http://[IP Address]/vcops-custom. 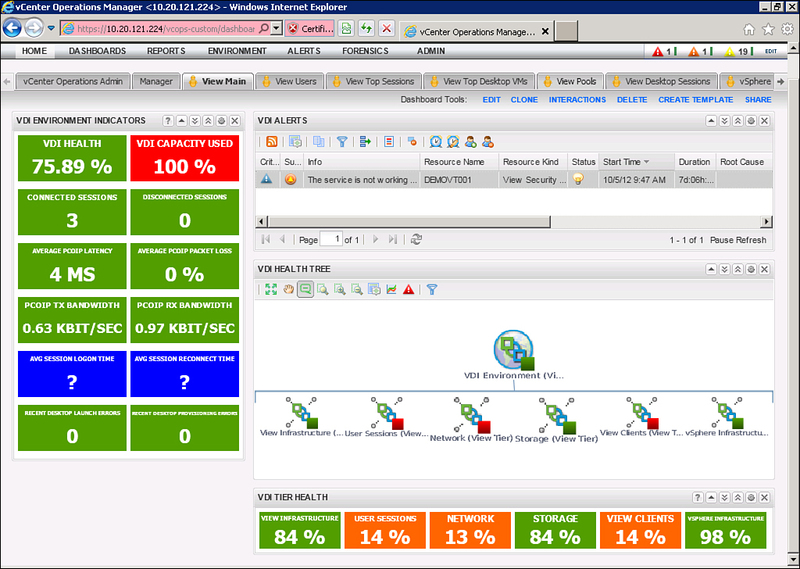 There, you see six additional dashboards plus the vSphere one included in the Advanced version. The first dashboard, called View Main, is the main one (see Figure 31). It gives a high-level overview of the general health of the environment from end to end. It includes important information such as underlying vSphere health, PCoIP latency, VDI capacity, and bandwidth utilization. Figure 31. Health of the environment.